When I was 13, a friend gave me the Earthsea trilogy for my birthday. 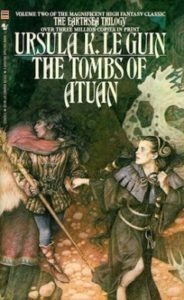 There are some books you remember as turning points in your career as a reader, and the entire trilogy, but especially A Wizard of Earthsea and The Tombs of Atuan, were that for me. I had always gravitated towards SFF, but these books really marked me. The world, the wizards, the forces of the Nameless dark and the power of naming one’s shadow, Ged’s and Tenar’s struggles with their own natures–these opened a door in me. There are books that touch a reader deeply, that make them consider the reader’s self and the world outside, that shape how one looks at the world. The beauty of speculative fiction is that talking about the impossible, the improbable, shines a light on who we are in the real world, and who other people might be. An archipelago of other experiences is out there, every book a doorway, waiting for the reader to step through. Ursula Le Guin’s books were always islands of understanding as well as delight for me to fall into. I can remember reading The Left Hand of Darkness a few years later, sitting in the cafeteria of my high school and reading through lunch as Genly and Estraven crossed the ice, and Genly’s understanding of Estraven and the world changed. I like to think stepping through that doorway helped me have understanding later on when my perception of people shifted. The structure of Four Ways to Forgiveness blew me away when I first read it: four linked stories exploring two linked planets, where one people have enslaved another. It’s a meditation on betrayal and freedom and forgiveness, and how people change. When I first decided I wanted to write seriously, it was to Le Guin’s Steering the Craft that I turned, working my way through every chapter and exercise in the book, a mentor in paper form. My husband sent me the news of Le Guin’s death. When I opened the news on my phone, I said, “Oh, no” out loud, and my eyes started watering. I never met Le Guin, but she nonetheless had an enormous impact on what I read, and how I think about stories, and how I think about people. She was, of course, a storyteller of immense skill as well as an elegant wordsmith, but when I think now on her collected works, what strikes me is the compassionate note that rings through all her books, whether for a bitter Sparrowhawk who’s almost lost himself in hawk form, or for Solly and Teyeo as they discover there’s more to each other than they thought. She produced an enormous body of work, and it comforts me that there are books of hers I’ve yet to read, as well as old favorites to revisit. Her books have always brought me greater understanding, since I was thirteen, and will continue to do so, whether it’s the first time I read them or the twelfth.